When you download music from the Internet, you may sometimes download file formats that your default audio player, mobile phone or mp3 player does not support. Maybe it is a Flac, Ogg or Ape file, audio files that are not that commonly supported. If you are lucky the site that you have downloaded the music from is offering it in other formats as well. If not, your best bet is to convert the audio format into a supported one. I have reviewed more than a dozen audio converters in the past. From Helium Audio Converter over Mobile Media Converter and Media Cope to Quick Media Converter and specialized tools such as Flac to Mp3. FlicFlac is a free portable audio converter for Windows that supports several popular music formats including mp3, wav, ape, flac and ogg. It lacks support for other popular audio formats like aac on the other hand. All you need to do to convert audio files is to drag and drop them into the drop area in the application window or click on the area to open a file browser. 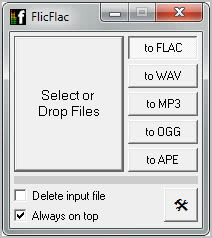 Before you do that you may want to change the output format, Flac is selected by default, to another format. A click on the new format makes it the default output format for the conversion. You may also want to click on the settings button to make changes to the audio quality of the output or to integrate the audio converter into the shell to make it accessible in Windows Explorer. The latter allows you to convert audio files right from within the file manager. Users can furthermore select to delete the input audio files after successful conversions. FlicFlac is definitely not the most complete audio converter but not all users need a program that supports all known audio files or offers editing options. Portability and ease of use, those two are the biggest strengths of FlicFlac. Windows users can download the latest version of the audio converter from the developer website. Seems like a good program, though I see a problem on the screenshot. Flac is loseless, which is another loseless format that it can convert from to flac. I am not too sure if APE is a loseless format. Frankly, converting mp3 or ogg to flac is plain stupid. Flac ot WAV and WAV to Flac conversion. The term “portable” was confusing. I had to look it up. Does it mean anything more in this context than “run from any drive without requiring installation or leaving behind system files”? Portable usually means that you can run the program without first installing it. Looks similar to the excellent File Blender previously showcased on Ghacks. I use too just portable Software, as Audio editors “Audacity” and for coding/decoding the “Bonkencoder”. But I think that for my Wav and mp3 requirements is your FlicFlac slightly better. Thank you for the tip.